Whether clients follow the diet because of celiac disease or the less understood gluten sensitivity, RDs serve as a guide for patients on a lifelong quest to relieve symptoms and improve health. After months of gastrointestinal discomfort, abdominal pain, and bloating followed by weeks of medical testing, Susan finally learned she has celiac disease. Frightened, confused, and overwhelmed about the next steps in her new restricted dietary lifestyle, she turned to an RD her physician recommended. The RD faces the challenge of calming her new patient, educating Susan about the celiac disease diagnosis, and walking with her along a journey fraught with misinformation and confusion. It's not surprising that many patients newly diagnosed with celiac disease become overwhelmed at the thought of modifying their lifestyle, including what they can and cannot eat in restaurants and at parties. Fortunately, Susan and others with celiac disease aren't alone in their journey. According to Rachel Begun, MS, RD, CDN, a food and nutrition consultant and spokesperson for the Academy of Nutrition and Dietetics (the Academy), approximately 1% of the population has celiac disease, and about 90% of them are undiagnosed or misdiagnosed. "A bigger portion of the population experiences gluten sensitivity to varying degrees. Estimates are that as much as 6% of the population, or 20 million Americans, may be gluten sensitive," Begun says. Celiac disease is an autoimmune disorder in which the body triggers an attack on the intestines every time gluten is eaten, Begun says. Inflammation and damage occur in the small intestine and nutrients can't be absorbed, leading to nutrition deficiencies and a wide range of symptoms. Begun says many people with the disease are asymptomatic and thus don't experience any negative symptoms after eating gluten. "They are, however, experiencing the same damage to the intestines as those who do experience symptoms," she cautions. According to the National Foundation for Celiac Awareness, non-celiac gluten sensitivity is found in "individuals who cannot tolerate gluten and experience symptoms similar to those with celiac disease but yet who lack the same antibodies and intestinal damage as seen in celiac disease. Early research suggests that non-celiac gluten sensitivity is an innate immune response, as opposed to an adaptive immune response (such as autoimmune) or allergic reaction." "We don't know much about gluten sensitivity just yet, but we do know that it's a unique condition from celiac disease and involves an immune response," Begun says. "While symptoms of gluten sensitivity can be similar to those of celiac disease, people with gluten sensitivity don't produce antibodies to gluten or show signs of damage to the intestine." Laura Jeffers, MEd, RD, LD, says patients usually are eager to embrace the gluten-free (GF) lifestyle once they realize how it will benefit them: symptom relief, more energy, better health status, and an improved quality of life. Jeffers, outpatient manager for nutrition therapy at the Digestive Disease Institute at the Cleveland Clinic, teaches patients the importance of adopting the changes involved in living GF for the long haul. "I stress the importance of GF for life," Jeffers says. "No small bites every now and then and no 'mostly GF.' I also explain that wheat free is not gluten free and that reading labels must become a habit. While there's no cure for [celiac disease], the GF diet can relieve symptoms of the disease, and patients can feel healthy and full of energy while on the diet. The mucosal damage is a result of a genetic predisposition in combination with environmental factors and inflammation that 's immune based." Therefore it's important for dietitians to clarify with their patients that even the tiniest amount of gluten may cause intestinal damage even if there are no overt symptoms. at Shawano Medical Center in Wisconsin. Most of Begun's patients feel overwhelmed with the dietary changes that are part of a GF diet. "In particular, parents of [young] celiac disease patients can feel overwhelmed knowing they're responsible for ensuring their kids avoid gluten. While some are relieved knowing they finally have found the answer to their health issues, others are in denial about having to change their diet," Begun says. "There's also the emotional part that comes with the social aspects of eating. People are worried they won't be able to enjoy eating out which, for many, is an important part of socializing with friends and family. In the end, though, most are happy to be feeling better and doing the right thing for their long-term health." The key types of "common" foods that are safe for patients with celiac disease include naturally GF items such as fruits, vegetables, meats, nuts, legumes, fish, poultry, eggs, and most dairy (eg, cheese, yogurt, cottage cheese). GF grains include rice and corn. Some less familiar GF options include flaxseeds, nut and bean flours, potato starch, quinoa, rice bran, teff, wild rice, tapioca, buckwheat, arrowroot, millet, amaranth, chia seeds, mesquite, montina, sago, and sorghum. Oats also are considered GF but only if they're labeled as such. Begun stresses RDs need to help their patients with celiac disease focus their diet on naturally GF foods rather than GF packaged alternatives. "It's even more important to get this message across with newly diagnosed patients because their bodies have been devoid of nutrients and need to heal," she says. "Nutrient-dense foods remedy nutrition deficiencies and help the body to heal faster." It's also important to meet patients where they are in terms of current lifestyle and dietary patterns. "If a patient has no cooking skills and is traveling for business five days a week, then it's a good idea to focus first on how to handle themselves in a restaurant," Begun says. "For the mother who's making most of the child's meals and snacks at home, then you want to teach them how to make smart choices at the grocery store as well as introduce them to common ingredients used in gluten-free cooking and baking." Avoiding cross-contamination when following a GF diet is of utmost importance. "It's very important to discuss cross-contamination with newly diagnosed patients," Jeffers says. "It's important for patients to understand how easily foods can become contaminated with gluten. If a gluten bun on a sandwich is removed and replaced with the GF bread, it's too late. Or if there are croutons on the salad and [they're] picked off, the salad shouldn't be eaten since it was already contaminated." Additionally, gluten can be spread from containers of food, such as peanut butter and jelly, when a knife that has touched gluten-containing bread is dipped into the jar. It's also important to use separate toasters and related small appliances as well as cutting boards and dishes when handling both GF and non-GF foods. If this isn't possible, the item must be thoroughly cleaned to remove any traces of gluten to avoid cross-contamination. "Be sure to tell patients to read the food labels of their favorite foods every six months, as ingredients can change at any time and some products that didn't contain gluten in the past may contain it now," Jeffers says. 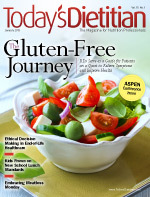 Mary K. Sharrett, MS, RD, LD, CNSD, a clinical dietitian in nutritional support services at Nationwide Children's Hospital in Columbus, Ohio, suggests RDs schedule two 45-minute to one-hour sessions with clients newly diagnosed with celiac disease because they'll have numerous questions, as there's much to learn about following a GF diet. "If you don't know the answer, don't try to guess. Tell them you'll get back to them and then find an expert to help you," says Sharrett, who's also a member of the Academy's celiac disease expert workgroup for the Evidence-Based Analysis Library and the founder and dietitian advisor for the Gluten-Free Gang, a celiac disease support group. "The Academy's Medical Nutrition Practice Group has a subunit called Dietitians in Gluten Intolerance Disease with lots of experts." Sharrett also recommends RDs provide a few naturally GF recipes to help clients start their journey. Moreover, RDs should determine some of their client's favorite meals and provide suggestions for making them GF. For instance, if a client enjoys tacos, suggesting a GF brand of taco seasoning is a good fix. "For patients having difficulty adhering to the diet, encourage them to get involved with a support group, online or in person," Jeffers says. "Also, let patients know there are many great online sources of gluten-free products, and some companies will send samples." Wespetal says it's also important to determine what research the patient already has done regarding celiac disease and a GF diet. "This will help clarify any misconceptions the patient may have about what celiac disease is and what their role is in managing it," she says. "Also, RDs should explain how to review ingredient lists on food packages. Is it clear to them that 'wheat free' does not mean 'gluten free'? Finally, use follow-up visits to assess the nutritional adequacy of the patient's typical eating pattern, especially fiber and B vitamins." "Your patients become very informed and may teach you something along the way," Jeffers says. "There's nothing wrong with learning from your patients especially since they're living it on a daily basis." For many people with celiac disease, eating at restaurants or attending parties especially may cause frustration and fear. "To increase the likelihood of getting a safe meal, call the restaurant ahead of time to let them know about your gluten-free needs," Begun says. "Right from the beginning you'll know if the restaurant isn't knowledgeable about serving people with dietary restrictions. If you get that gut feeling that they don't know what you're talking about, it's a red flag to make reservations somewhere else. I also recommend reviewing the restaurant's menu ahead of time so you can narrow down your choices and have a more focused conversation with the server. This is easier for the server, which makes it more likely you'll get a gluten-free meal." • Before going to a restaurant, try to view the menu online and identify possible GF items in advance. • Let the server know that you can't eat gluten, which includes avoiding wheat, rye, barley, and derivatives of those sources. • Salads should never have croutons, and confirm that salad ingredients are GF before consumption. • Always ask before ordering. Flour often is used to thicken soups, and meats may contain fillers made of gluten. • Avoid anything described as being encrusted, breaded, marinated, or served in an unknown broth. • Fried foods must be fried in separate oil to be considered GF. • Consider bringing your own GF bread or crackers. • Consider eating out at an ethnic restaurant, as many of the foods may be from GF sources (eg, rice, corn). • Don't attend the party hungry, as there may be few GF items from which to choose. • Bring your own GF bread or crackers or a GF item to share. • Never assume something is GF. Confirm that it's safe before eating it. • Fresh fruits, vegetables, dairy items, and fish are safe options as long as they didn't come in contact with any products containing gluten. Though following a GF diet may seem daunting at first, clients with celiac disease or gluten sensitivity, with the help of knowledgeable RDs, easily can navigate their way through daily living as well as special events without worrying that gluten will cross their lips and potentially cause problems once again. "Wheat is required to be identified [on a food label], as it is one of the top eight allergens that have to be declared on the label, according to the Food and Drug Administration's Food Allergy and Consumer Protection Act," explains Mary K. Sharrett, MS, RD, LD, CNSD. "Rye and oats aren't hidden in any ingredients, although oats need to be labeled gluten free to be sure they're uncontaminated. Barley is almost always listed as barley or malt. Brewer's yeast is likely to be contaminated with barley." Sharrett says hidden wheat may be found in products governed by the USDA because they don't have to follow the FDA's allergy labeling laws. "Therefore wheat may be in modified food starch, starch, or dextrin," Sharrett says. "The good news is that 80% to 90% of these companies do identify allergens." To identify a USDA-inspected food (eg, processed meat, poultry, eggs, and some mixed food products, such as soups containing meat) look for an "Inspected by the USDA" stamp on the front of the package. • Gluten-free corn tortilla chips are available in white, yellow, and blue varieties. You can enjoy some great flavor combinations when you pair them with salsa, hummus, cherry tomatoes, carrot sticks, or tart apple slices. • A handful of nuts or roasted soy nuts is a protein-rich snack and easy to store in your pantry, a desk drawer, a gym bag, or a purse. • Enjoy a gluten-free bagel or slices of bread with peanut butter. • Try orange slices with sugar snap peas when you know your next meal will be delayed. • Make your own snack mix with gluten-free cereal squares, dried fruit, and sunflower or pumpkin seeds.